For my regular blog readers, you know that we love to expose our kids to people and their cultures from around the world. My Mom lives on Kauai and I’ve been visiting the Hawaiian Islands since I was a kid. Maui is a fantastic blend of activities and gorgeous landscapes. Last year, we explored the Maui Ocean Center and did the Four Winds Maui snorkeling boat ride and had a blast! Two years ago, I took my oldest on the Road to Hana, Haleakala, and I`ao Needle. 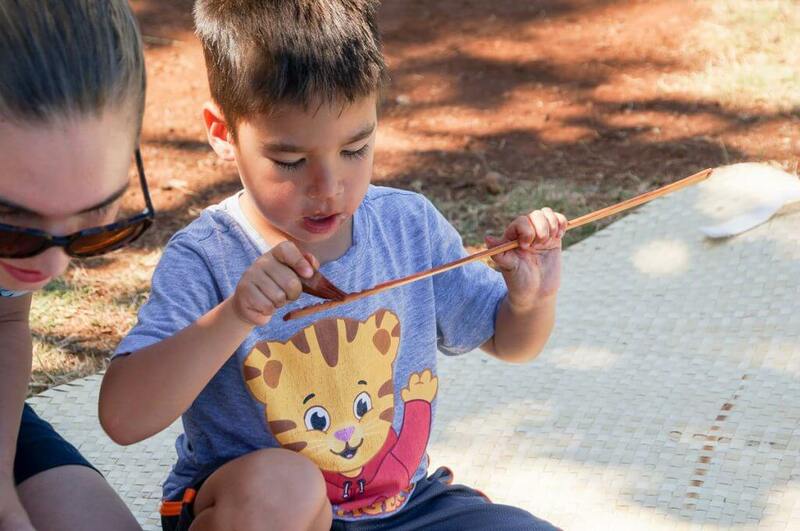 As this was my 3.5-year-old’s third trip to Maui, I was looking for a deeper connection to Hawaiian culture than our previous activities. We wanted a fun thing to do in Maui with kids. Thankfully, Maui Nei Native Expeditions offers authentic Hawaiian cultural tours and I knew that’s what we needed to do. My family decided to try the Discover Old Hawaii Tour by Maui Nei because we feel the best way to understand a place is through its culture. This tour is 3.5 hours and incorporates a bit of history, geography, and hands-on cultural crafts. 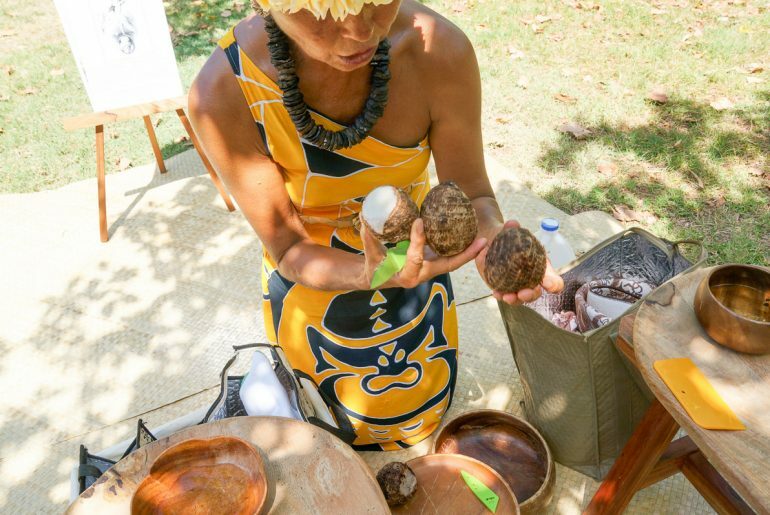 We immersed ourselves in Hawaiian cultural arts and skills while listening to stories of Lahaina’s sacred sites and learning a traditional way of life. 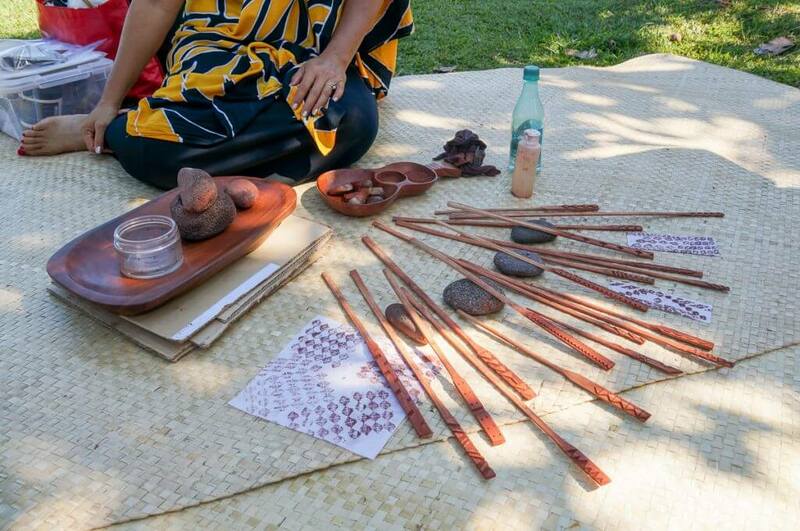 According to the official description of the Maui Nei Discover Old Hawaii Tour, “At each sacred site, a Maui Nei kumu (teacher/guide) will show you how to make a cultural item, using traditional methods of old Hawaii while explaining the background of his or her special skill and the history of its uses. Our guide Keoki was fantastic! I like to think of him as the host of our tour, as he escorted us to each cultural educator throughout the morning. Not only was he knowledgeable about what he was talking about, but he was passionate about sharing that with us. READ Which of These 12 Maui Luaus is the Best Luau in Maui? One of the major draws of this tour for families is all the hands-on activities. I was thoroughly impressed with how well each station was set up and featured a different guide who had extensive knowledge about each activity. It would be perfect for kids who have never-ending questions about everything they do! 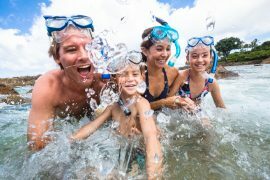 It’s one of the most fun things to do in Maui with kids! My oldest is 3.5-years-old and he participated in each activity. 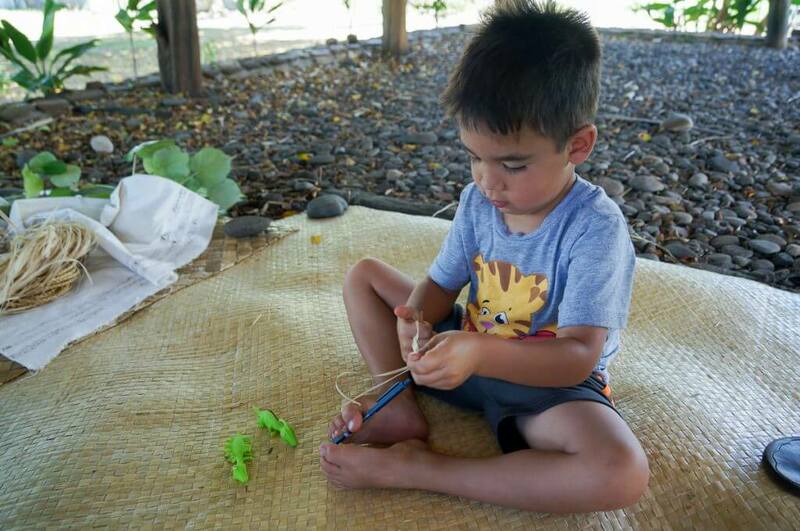 We brought along some little toys to keep his hands occupied while the Maui Nei guides explained the activities. Our 10-month-old baby only participated in the activity involving food! After hearing a bit about how the Hawaiians used to make tapa cloth from bark, we got to try our hand at stamping our own prints. One of the most fascinating parts was to see how the ink was made. Our guide Maile scraped some bright red dirt from the mountain before our tour. She poured a bit into a porous stone bowl and ground up the dirt. Then Maile ground up some Hawaiian salt (to set the paint) and added some oil and a bit of water. After stirring it around, we were ready to stamp! Each stamp was handmade and the shapes represented things like the sun, wind, mountains, family structures, and more. Maile encouraged us to choose a stamp (or two or three) that represented where we come from. So, I chose the stamp that looked like wind to represent how my life with two little kids feels like a whirlwind. However, my 3.5-year-old promptly painted over it with his brush, which is an even better representation of my life with little kids! This was such a cool experience and my boys loved it! My family enjoys eating poi and I can say with authority that we’ve never had poi so fresh! I loved that our guide Wainani set up this station with a bench for us to straddle, water to wash our hands, and had all the tools we needed. Wainani started with taro that had been steamed and peeled. We chopped it into small pieces and then mashed the taro with a stone pounder. My oldest thought that we were going to pound the taro with a hammer, so he was a bit confused when I started grinding with the stone tool. Our favorite part was eating the poi! The taro we used was very mild and since it was so fresh, it wasn’t fermented. Our 10-month-old started eating it as my husband was still pounding it and couldn’t get enough! At the end, we were able to bag up what we made to take with us. It’s one of my top things to do in Maui with kids! I thought this was the most relaxing of the activities. We sat in the shade of a hale as we watched our guide Kalapana show us a Hawaiian weapon he crafted out of lauhala. I had never seen anything like it before, but apparently it’s similar to what they used in biblical times. Kalapana was very patient with us and he helped us individually twist the lauhala to make rope bracelets. Once we had enough for a bracelet, we were able to adorn it with a kukui nut or shell. Our guide told us that they repurpose these from kukui leis and shell decorations. 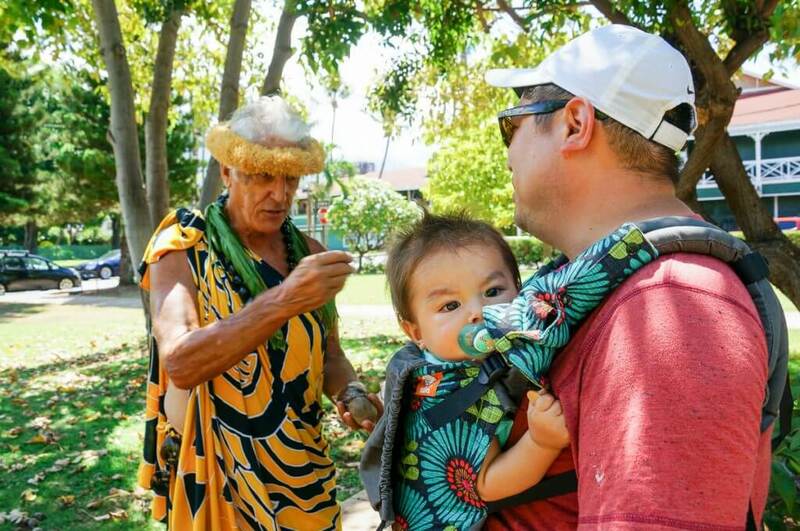 I highly, highly recommend these tours to families looking for a bit of culture in their Maui vacation. It’s one of my top things to do in Maui with kids. I’ve visited the Hawaiian Islands more than 30 times and have studied hula for more than 20 years. However, I was impressed with how much new information I learned. The activities reminded me a bit of the Polynesian Cultural Center on Oahu, but with much more information and personalized attention. Even if you don’t think you are interested in Hawaiian culture, meeting the Maui Nei guides might change your mind. They are so welcoming and present their information in a way that is easy for children and adults to understand. We felt less like a tourist and more like we were sitting in someone’s back yard just talking about life. Additionally, they seemed truly thankful that we dedicated part of our day to learning about the culture that makes Maui such a wonderful place to visit. 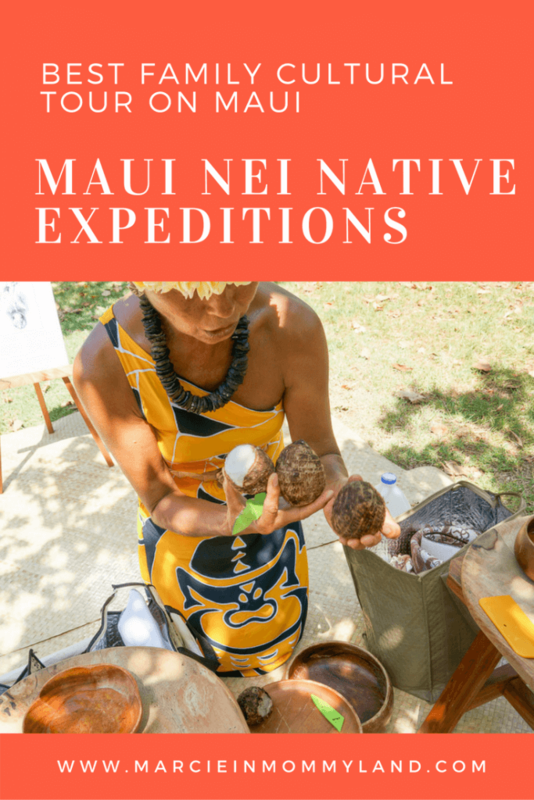 Maui Nei Native Expeditions provided us with a complimentary tour for my family. All opinions are my own. What great recommendations! I like the idea of bamboo printing and pounding taro. In Trinidad and Tobago (which has a similar climate to Hawaii), we eat a lot of taro but we call it dasheen. Oh how interesting! Do you also pound it to make a paste or just eat it like a root veggie? It was such a fascinating tour! I’m definitely going to do it next time I’m back on Maui to see what other tours are available. This looks like a wonderful experience. I know my family would really enjoy this. It’s a great way to spend a morning with your family! The culture of Hawaii is so rich and interesting. Hence, this experience is a cool way to get to experience that! It’s cool that you got to experience this with your family as well, it truly is a wholesome activity for everyone! It was a fabulous tour led by amazing people! My favorite moments were watching my kids participate! What an amazing experience! We like to travel deeper, too, and try to make connections with the local culture. This seems like a great way to do it. 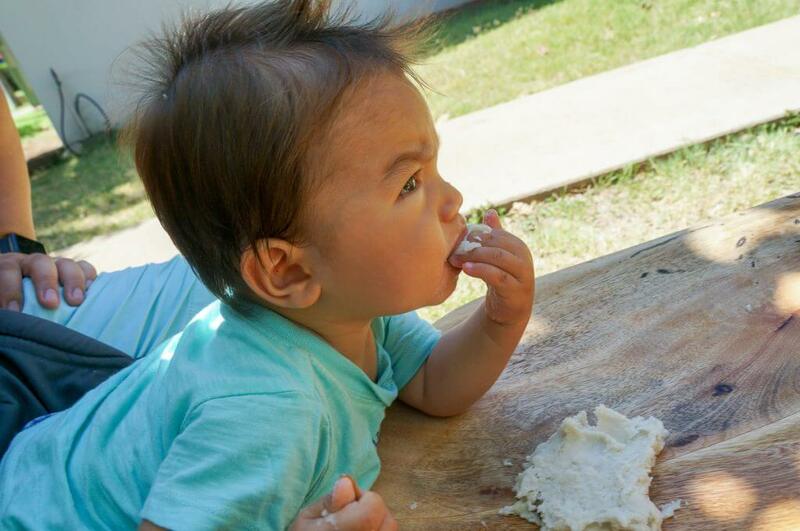 Your little one eating the poi is so cute! We are hoping to get to Kauai next year and this will top my list of things to do! Whoops– Maui! We actually want to go to both islands. This sounds like a great tour! I usually find tours relatively boring (not a history geek) but love the once that actually let you do stuff. I actually didn’t know what poi was and had to google it – sounds great! I’m so glad you googled poi! That made my day! Our family learns best by doing, so this was perfect for us! Hawaiian culture sounds fascinating and I’m glad you brought up something more to the island than just the beaches and volcanoes. Your children are adorable (!) and your 3 year old looks so happy trying to make his bracelet. You’re very lucky you’ve visited Hawaii more than 20 times!! It’s probably my dream destination, but it’s so expensive. Ah well, one day! Yes, having a relative there helps a ton! It was an amazing tour! I’m not sure I understand your comment. First of all, your blog design is gorgeous! Love the flowery pattern. Makes me thing of – Hawaii. What a coincidence! 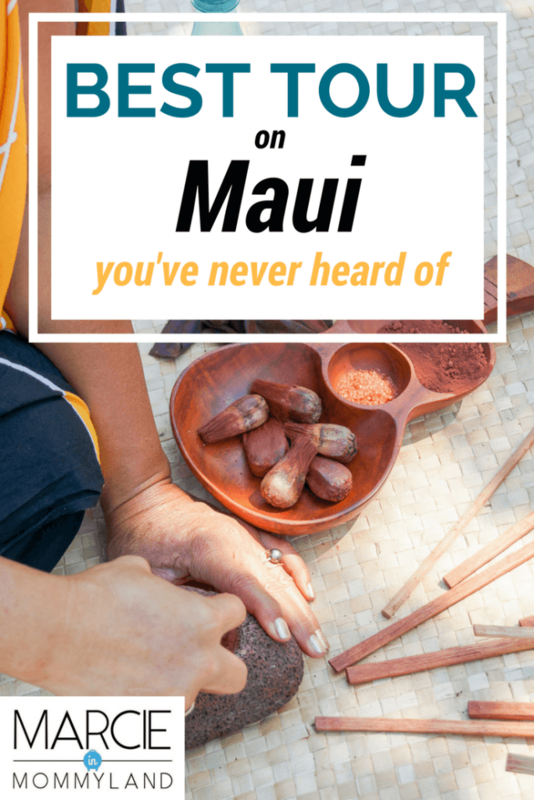 Even though I can never get enough of the white sandy beaches and the gritty but mesmerizing volcanoes, I still enjoyed reading about a completely different aspect of Hawaii, its culture, which I didnt know much about prior this post. This was very inspirational, thank you for sharing, hopefully I can visit soon enough! You just made my heart melt! Thanks so much for your compliments! I’m glad I can introduce you to a bit of Hawaiian culture! I love that you make it a point to understand the cultural history and significance, and it has inspired me. When I visit new places, it is important to become submerged in the culture and understand their history and their reasoning. I love the sound of this tour and I would love to visit and try it. It was incredible! I feel like too many people go to Hawaii to drink mai tais and go parasailing and forget that there’s a whole culture they are missing out on. It’s especially cool to get a bit of Hawaiian culture there! Oh yes! We had a lady from Alabama on our tour who had never been to Hawaii. She had a blast! I love this post! The sole fact that while in Hawaii one can fall into all the tourist traps, but instead of listing the places you must go to, you decided to post about bringing old Hawaiian traditions to life with hands-on activities at the Maui New Native Expeditions and you are actually teaching your readers about Hawaiian culture and traditions.I definitely need to try Poi and after you assured us that you and your family love it and that you had the fresher poi there. Thanks! I was really blown away with how well this tour was organized! Hawaiian culture is so rich with tradition and there’s so much to experience! What an awesome experience for your kids! My 5 year old loves poi too, we had the purple when we visited. This is the best Hawaii post yet, away from all the tourist traps. This was our first time eating poi that wasn’t purple! It was a different variety and was a bit milder. One of the best and most refreshing posts I have read about Hawaii. I love the focus on cultural activities. Like you I think it is important to expose my children to different people, culture, traditions, etc. They can have fun at the beach at home but the learning opportunity that will come from these activities is priceless. Thank you so much for sharing them and giving me a cultural option and a real reason why I should take my children to these Islands. Your comments makes my heart so happy! I love experiencing things that are truly unique to the places we visit. This is one of them! This looks like such a great tour! I love all the hands-on things you get to do while learning some history. I haven’t been to Hawaii yet, but I hope to someday soon. This makes me want to go even more! I hope you get to explore and discover the authentic Hawaii! What a fabulous tour. For the last several years, we have been part of a outrigger racing team that was also a 501c.3 to build Hawaiian culture. The islands have such a rich, cultural history that they are very proud of. It’s so wonderful that you got to experience this part of Maui and share it with your kids. Oh how awesome! We have those here in Seattle, too! The races are so much fun to watch! It was definitely enriching! Such a wonderful experience! This is a great post, I love how you go into detail about each activity. Very cool how they make the paint – this could definitely be a great pre-school activity! I agree, it’s great to know about the culture of wherever you travel to so this would be an awesome thing to do for families and solo travelers alike in Maui. Thanks! The paint was so cool and I’m curious how it will turn out if I try to make it with dirt from the Seattle-area! This is such a cool thing! I love learning about cultural history too and this is a great way to do it. I especially like the printing and weaving! That’s awesome that even YOU could learn new information. It was one of the best tours I’ve been on. I wish I could find tours like this other places we visit. I visited Hawaii but never saw any of the cultural side. I agree it’s important for kids to see and learn about different cultures from a young age. 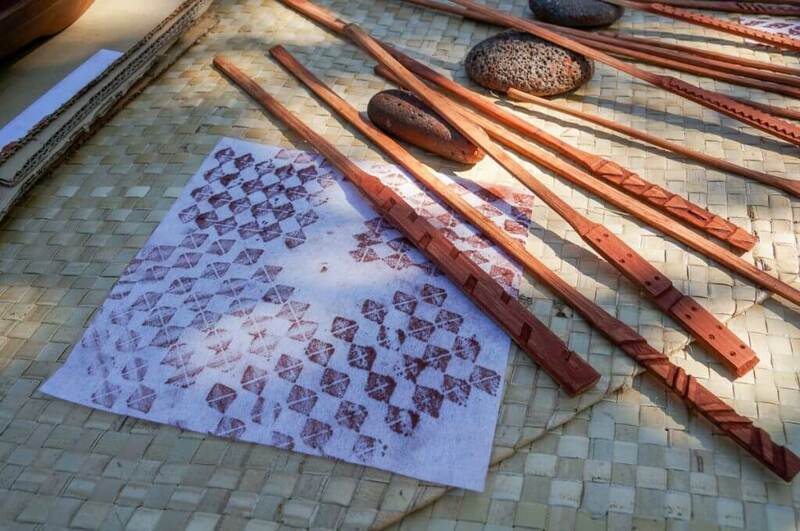 The weaving of Hawaiian weapons look s very interesting. The Hawaiian weapon was fascinating! I hadn’t seen it before and it was so intricate! It sounded like such nice way to get to know their culture. Hawaii is a place I have always thought of visiting and never had the chance. That made me visit asap! I hope you are able to visit! There’s so much more to Hawaii than just the lovely beaches! 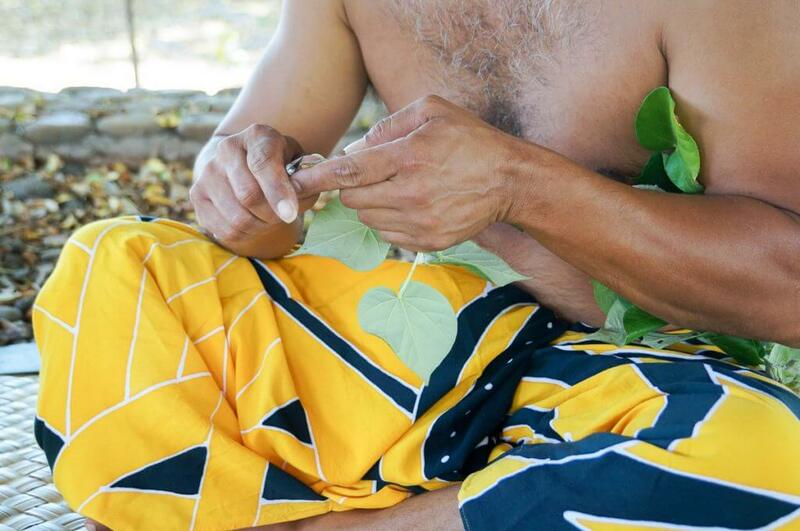 They do an amazing job providing hands-on experiences for those interested in Hawaiian culture! These look amazing! What a great experience for the kids. I wish that my parents had taken us on adventures like this when I was growing up. It is so heartening to see someone inculcating good valued in the kids by engaging them in a meaningful way. I have not heard of poi before. Sounds interesting. Lauhala weaving seems complicated to me. Though I am intrigued that it dates back to biblical times. Thanks for giving me useful ideas to plan trip with my nephews. 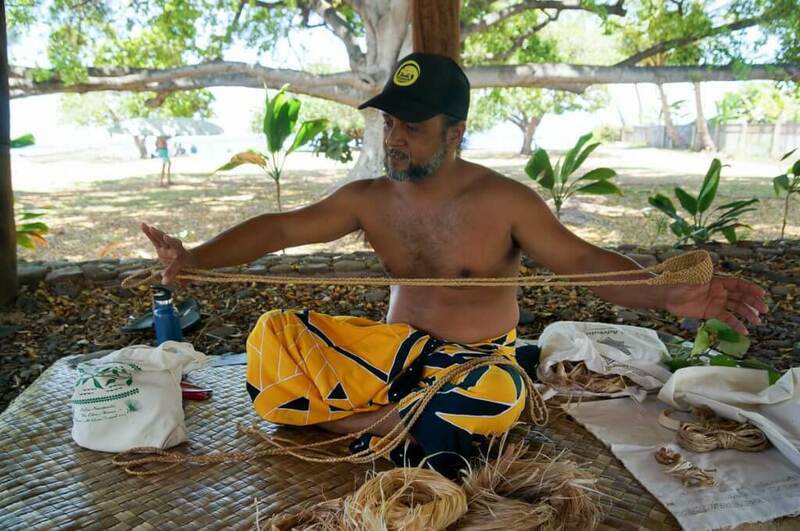 Lauhala weaving can be simple! But, it can also get super complicated! This is absolutely incredible. I loved to spend time with locals and learn new things. I am so glad that you and your family love doing the same. It’s so adorable to see your kids enjoying the local experience. I really like the way your son is making the bracelet. I would love to take Discover Old Hawaii Tour someday. I’m hoping to find experiences of this caliber other places we travel in the next few years! 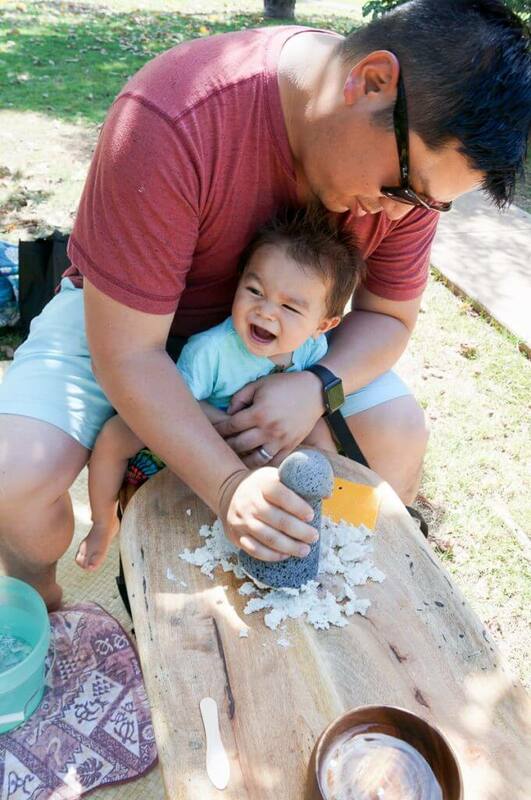 Your little one looks like he really enjoyed the poi pounding! I remember learning about bamboo printing for a brief turn in art class when I was in school, I found it so interesting back then and still do to this day. This tour sounds incredible! The fact that there’s so many activities and things to keep busy as opposed to just learning by watching is so great! I get bored on tours with too much talking and not enough action haha. Btw I am super jealous you’ve been regularly visiting Hawaii since you were a kid!! It’s definitely one of my dream destinations. I’ve always wanted to visit Hawaii! I have a friend who often goes to Maui to scuba dive, so I always see pictures and hear about it. Poi pounding seems like fun but also a lot of work! I think it’s great that you were able to experience some native traditions. It’s amazing when destinations arrange activities that are friendly to the whole family, mostly for the kids. We went to Maui, beautiful place. Hope y’all enjoyed your time there as much as we did!